The Steel City might not pop to mind when you think of taking a ski trip. But 10 resorts within 100 miles of Pittsburgh makes it a solid base destination for all levels of skiers and snowboarders. Most western Pennsylvania ski resorts open by January 1 with a respectable base of snow. These ski areas range from small, inexpensive slopes such as Boyce Park, with 150 feet of vertical and $8 lift tickets on Wednesdays; to Blue Knob ski resort with the largest vertical drop and most challenging terrain in the area; to Seven Springs, one of the top-rated ski resorts in the East. Blue Knob, located among the highest peaks in the Allegheny Mountains at the northwestern tip of Bedford County, should be your destination if you crave steep drops and long runs. But 16 trails and three lifts with plenty of easy routes from the top make it a good choice for beginner and intermediate skiers, too. The convenience of this small ski slope, located just 17 miles from downtown Pittsburgh, makes up for what it may lack in terrain and amenities. This inexpensive option, with all of the necessary rental equipment, including helmets, makes a good choice for kids and adult beginners, or a fun afternoon activity with family and friends. Nighttime hours from Monday through Friday let locals take advantage of the resident discount and get a few runs in after work. A good mix of beginner, intermediate and advanced terrain plus the robust kids ski school program makes it easy to see why Hidden Valley consistently earns recognition as one of the Mid-Atlantic's most popular family ski resorts. Located just an hour from Pittsburgh in the Laurel Highlands, the resort caters to families with children with a snow tubing park and kid-friendly dining. Home of the famous double-diamond Lower Wildcat slope, Laurel Mountain, located on 493 acres of Laurel Mountain State Park in south-central Pennsylvania boasts the highest vertical drop on the Laurel Ridge in Pennsylvania at 761 feet. Laurel Mountain joins Hidden Valley Resort, Mystic Mountain and Seven Springs Mountain Resort to make the Laurel Highlands, a premier snow-sports destination located fewer than 100 miles from Pittsburgh and within 200 miles of other major metro areas, including the Washington, D.C./Baltimore region and both Cleveland and Columbus, Ohio. Formerly known as Mountain View, this small ski area in Erie County maintains 10 slopes and trails for downhill skiing and snowboarding. With a ski school and tubing park, Monday night College Night, Two-for-Tuesday discount, and a full rental shop with tunes available, Mount Pleasant makes an appealing winter destination for the whole family. The renowned Nemacolin Woodlands Resort earned its reputation as a year-round destination when it opened Mystic Mountain. With six slopes and trails ranging from beginner to expert, skiers and snowboarders of all ages and ability can carve their marks into the mountain. Dog-sledding, snow tubing, cross-country skiing, and snowshoeing round out the options for winter fun at this Laurel Highlands resort. Just across the border with West Virginia, Oglebay Resort in Wheeling blows a respectable base of man-made snow onto a slope adjacent to its large grounds. The Nutting Winter Sports Complex offers skiing and snowboarding on a groomed trail, plus snow tubing, Fridays through Sundays (and school holidays), weather permitting, from mid-December through mid-March. ​Pennsylvania's largest ski area, Seven Springs, was named for an old property deed describing the land as a "piece of property with seven springs on it." Located in Pennsylvania's Laurel Highlands, this popular mountain resort operates year-round. Winter brings plenty of snow to the 33 slopes and trails, and seven terrain parks on the mountain encourage you to let the skis or snowboard fly. Learning to ski or snowboard at a large resort can be intimidating, with people whizzing by and too many runs to choose. The small Willowbrook area near Belle Vernon just 30 minutes south of downtown Pittsburgh gives beginners a safe space to practice their turns. More advanced skiers and riders appreciate the famous giant moguls. Ski magazine rated Wisp Resort, in Garrett County, Maryland, about 100 miles from Pittsburgh, among the top 80 ski resorts in the nation. 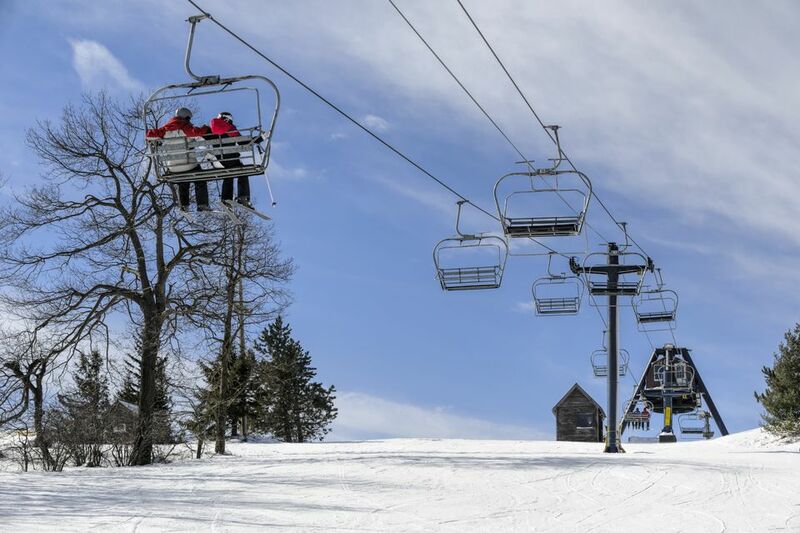 With 34 slopes, snow tubing, ice skating, cross-country skiing, snowshoeing, and on-mountain lodging, dining, and shopping during the winter months, Wisp attracts snow lovers from around the mid-Atlantic region.